Among the components that Bitcoin miners often overlook is the power supply unit (PSU). Without a PSU, your miner will not run. The power supply is also crucial because its quality will dictate the Bitcoin miner you will connect to it down the road. If you select the low-end power supplies, you might not be able to use the higher end miners. What’s more, a lower end power supply unit might damage your miner in the long run. The Antminer Power Supply APW3 Supply (APW3++ [email protected] [email protected] w/ 10 Connectors) should be among your first consideration when shopping for a Bitcoin miner power supply. The manufacturer has specifically designed the product for mining functions and they have therefore combined higher conversion efficiency and stronger dynamic performance into the power dense package. The Antminer Power Supply also boasts overload, overheat, short circuit, and lower voltage protection. The PSU has many features that make it ideal for crypto currencies mining operations. The air flows from its AC input to its DC output, a feature you expect in most Bitcoin miners. That proves more beneficial for individuals with large scale mining operations, particularly where heat management is the primary consideration. The PCB boasts a conformal coating that prevents damages from higher voltage spark discharges on the MOS pins or the high pressure solder joints whenever dust or external conductive particles enter the PSU. The Antminer Power Supply will work stably in any environment with 50 degree Celsius ambient temperature. Whenever the temperature exceeds 50 degree Celsius, the power supply unit should be under-clocked. And considering the higher temperatures in mining operations, the manufacturer selects all the internal components with a 105 degrees Celsius standard, which means that the product has a longer lifespan than the general use PSUs in the market. Requires 205V-264V outlets to function. It might not work on the United States’ residential 110V outlets. Features five pairs of 6-pin PCl-e power connectors. They are 10 in total. 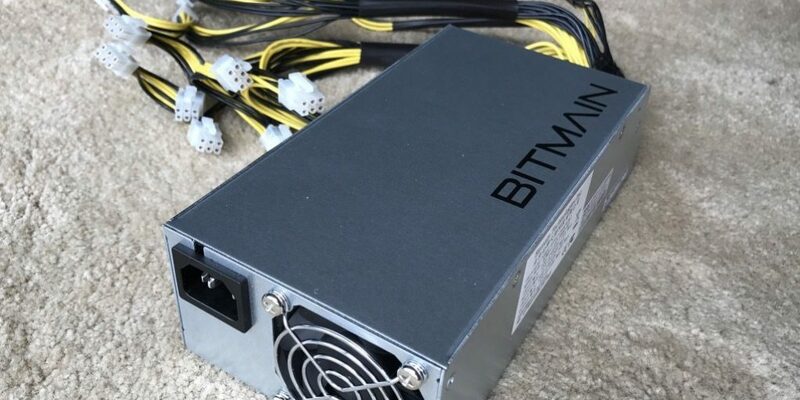 The Antminer Power Supply will only power a single L3+ Bitcoin miner when connected to 110V power supply. If you need to power two L3+ miners, you will have to connect it to 220-240V circuit. You will have to check the voltage circuit you are intending to use. The product powers the AntMiner S9 or D3 when connected to the 220V power outlet. The AntMiner L3+ needs 9 12V PCIE connectors to function. The AntMiner Power Supply APW3++ has 10PCI-e connectors and it will need 220V power supply to generate 1600W. The manufacturer recommends that you should use one power supply for every machine. If the power supply is non-independent, you can connect the four hash boards to different power supply. Avoid connecting a hash board to many power supplies. It is important you ensure that every hash board is properly powered. The L3+ has nine PCL-e interface, two for every hash board and one for the control board. Remember to connect them properly. Moreover, the recommended ambient temperature should range between 10 degrees to 30 degrees Celsius. The recommended ambient humidity should be around 40%. Higher dust and humidity accumulation can cause short circuit and corrosion to the machine’s hash board – the hash board is not repairable. To protect the control board and the hash board, ground the machine properly. The L3+ features two fans. If one fan is not detected, the machine will continue functioning for a short time and then alarm. Check the machine’s GUI to ensure that the two fans are detectable. The placement of your Bitcoin miner is also important. When running, you should avoid moving it around. Pick a place where the PSU’s power cables will reach and if you need additional fans, ensure that they can reach the power source. The miner should have free air supply. An uninterruptable power supply (UPS) is optional. If you will be running a single or two miners, it might be a better idea. However, if you will be running many units, it will get more expensive. It prevents power surges from damaging the PSU and the Bitcoin miner. A UPS will generally last for many years and will be a great investment for your computer gear. To benefit from Bitcoin Mining, you will have to evaluate your monthly electricity bill before other things. Generally, power companies charge per KWh basis. That represents the amount a 1000 watt device will spend within one hour. Secondly, you will have to look at the available mining hardware options. The Antminer Power Supply APW3 is among the most popular mining power supply units (PSUs) in the market. Antminer Power Supply APW3 uses a PCL-e connector that is compatible with the currently available ATX PSUs and most Bitcoin miners in the market. A single APW3++12-1600 will power only one S9 or one D3 or one L3+. Its higher power efficiency will translate to bigger cost savings. For example, when a person uses a second hand PSU that runs at 83% efficiency, compared to AntMiner Power Supply which runs at 93.8% efficiency, assuming that the electricity cost remains constant at $0.10 per KWh, the user may save over $150 per year. The overall performance of a PSU plays a bigger part in determining the machine’s reliability. So, you have to be careful during your purchase. The right PSU should have protection features that can save all components including the power supply itself if anything went wrong. The AntMiner Power Supply (APW3++ [email protected] [email protected] w/ 10 Connectors) is one of the recommended PSUs for Bitcoin miners. It provides amazing performance and silent operation. It will provide 1600W power when connected to a 220V power source and its downside might be the higher price, which the excellent build quality has justified.